Continuing tonight with the second and third rounds, the bulk of work done at all of the 32 NFL teams will be in a room that has a variety of names ranging form “Draft Room” to “War Room” All the work leading up to Draft Day has been done days before the Draft begins and the final days leading up to the Draft a variety of things are done. The scouts, along with being involved in the picks Friday & Saturday, may also be doing some recruiting of players the club feels won’t be drafted and will be available as undrafted free agents. Trying to recruit undrafted players after the draft is a losing proposition as this gets very hectic in the two to three hour period after the draft. Most undrafted free agents are signed in a matter of hours of the draft ending. Getting back to Draft Day and the Draft Room, not all 32 draft rooms are the same. When I worked for the New York Giants, both the scouting staff and the coaching staff along with the General Manager and team owner were in the room for the entire draft. When I was with the Bears, the people in the room consisted of the scouting staff, the General Manager, the Head Coach, team president and ownership. The coaching staff was available to come in to the room at any time to answer any questions that we may have on a player or players. 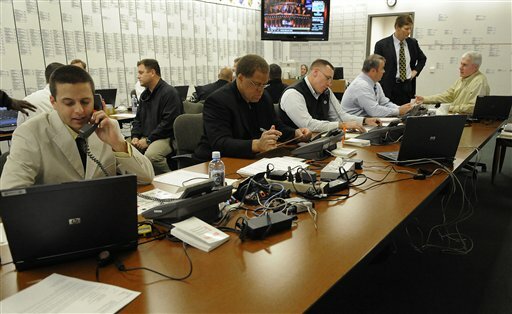 I was a consultant for the Philadelphia Eagles for the 2013 Draft and in their draft room was no more than 10 people which included the GM, Head Coach, the player personnel director, scouting director, pro scouting director, head trainer, and owner. The Eagles Draft Room wasn’t that large and the remainder of the scouting staff was in a conference room adjacent to the draft room. The walls of most Draft Rooms are similar. On one wall is a board that has the players ranked from best to worst regardless of position. That board is the “final ranked’ players and in many cases consists of around 75 to 125 names depending on the team. The players the team’s draft over the next three days comes from that board. The list isn’t say…the top 100 players…but rather a list of players that the team is interested in drafting during the three days of the draft. Some of those players are “A” level players or players you like for the first and second round, “B” level players for the third and fourth round and “C” level for the rest of the draft. If the team is lucky not only will they get all their drafted players from this board but also a few undrafted free agents. On an adjacent wall, is a board that has players listed by position, best to worst. This board has all the players at each position that the team has a draftable grade on. On a third wall is a board that has all 32 teams. As one of those teams selects a player, a card with the drafted player’s name, position and grade gets placed in a column under that team’s name. That way, you always have in front of you what each team has done during the draft. When the NFL went to a three day draft format, it made to job of personnel people a lot easier. On Thursday, the first day of the draft, a high percentage of the thought process in the draft room is just on that first round pick. In the meeting leading up to the draft day, the scouts and coaches went over all the players and scenarios for draft weekend, especially the first round. In the case of the Bills, the team most likely had a list of three or four players that they already have prioritized. When the team was ready to trade up, it had already been thoroughly talked about and a plan has been put in place to accomplish those goals. In the case of moving up, the team knows exactly how much it will cost to make that move. A trade up is always for one specific player and the team has already determined how far up they will go to get that player. They know what the cost will be and just before the team that drafts in the slot they want a call will be put into that team to see if a trade can be consummated. In the days leading up to the draft, a preliminary call has already been made to that call so they know to expect it. If that team is willing to move down and terms of the trade are acceptable, than the trade is made. The beauty of the draft being a three day affair is there is plenty of time to prepare for each day. Friday night is when the second day of the draft takes place, and the team has all day Friday to get ready. By this I mean, each club re-looks at their board and prepares for the different scenarios. In the case of Bills, the don’t have a second rounder and just the #96 pick in the third round. Going into the draft, they have established goals of what they want to accomplish during the draft as far as acquiring players at certain positions. Knowing what they acquired in the first round, they will now create a plan for day two. Often looking at the strength of the board after round one helps the team determine what they will do in the second and third rounds. If they hope to acquire players at two or three different positions they will look at the board and see which of the two positions has more depth to it on the board. The position with the weaker depth may be where the team chooses to select a player from in the second round. Of course value also comes into play as you never want to drop down in value to select a player at a need position. You never know how the draft is going to fall so a team may well come out of a draft without all their needs being filled. That happens because the draft just didn’t fall the way you had hoped. A well prepared club can adjust to those changing scenarios. Just like with day two, the draft board is adjusted a bit depending on what the team’s selections were in the first three rounds. Once you get to the fourth round, a team has to draft for value regardless of position. If there is a player that stands out on the board when it’s your turn to select than you almost have to select that player. Not taking the best player at that time defeats the whole purpose of scouting. Hopefully the best player is a player at a need position, but if he isn’t it doesn’t matter. The draft is about acquiring talent. In the 2017 Draft, Nate Peterman, Matt Nilano and Tanner Vallejo were all Day Three selections by the Bills. This year, the Bills hope to do as well or better in these later rounds.